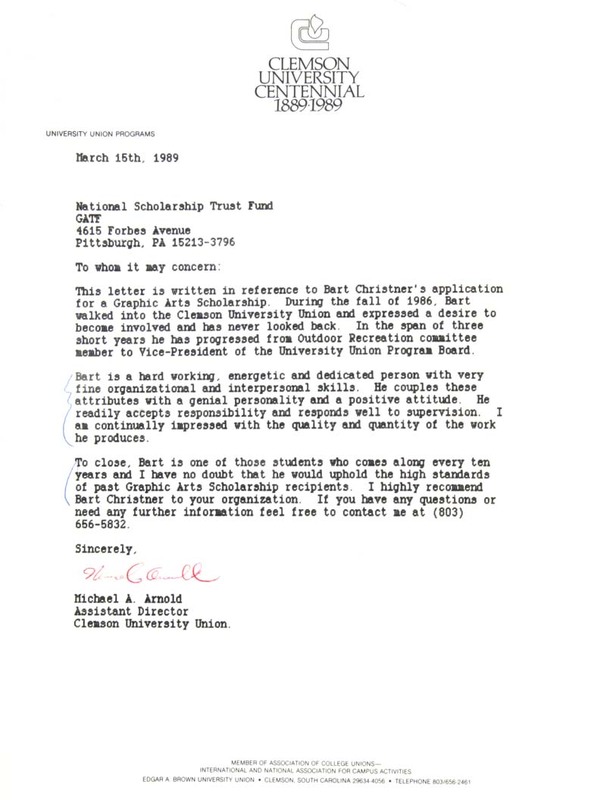 This letter is written in reference to Bart Christner's application for a Graphic Arts Scholarship. During the fall of 1986, Bart walked into the Clemson University Union and expressed a desire to become involved and has never looked back. In the span of three short years he has progressed from Outdoor Recreation Committee member to Vice-President of the University Union Program Board. Bart is a hard-working, energetic and dedicated person with very fine organizational and interpersonal skills. he couples these attributes with a genial personality and a positive attitude. He readily accepts responsibility and responds well to supervision. I am continually impressed with the quality and quantity of the work he produces. To close, Bart is one of those students who comes along every ten years and I have no doubt that he would uphold the high standards of past Graphic Arts Scholarship recipients. I highly recommend Bart Christner to your organization. If you have any questions or need any further information feel free to contact me.